This website includes a facility to make additions and amendments to the theory descriptions, lists of constructs and network analyses that can be incorporated into future editions. In due course, it will also include a database of the theories which can be searched according to the constructs used. This will be the result of current work which is mapping the constructs across theories, which is a formidable task given >1000 constructs and the work required to assess similarity and difference of construct labels. This book is a wonderful resource for students, scientists and practitioners working to encourage and evaluate behaviour change strategies. 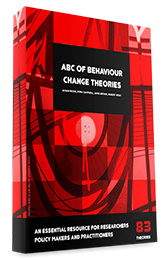 This impressive book will facilitate the integration of theory and evidence in a cumulative science of behaviour change. This book will greatly assist researchers and practitioners interested in behaviour change to navigate their way in the Babel of theories that have developed. This compendium’s structured summaries of current behavioural theory (and their inter-relationships) will be a major resource for anyone interested in developing theory-informed implementation programs. This book and website will be an important resource for people working to improve public health in any setting.